If you thought that the Bond had he best Aston Martin unveiled in recent years, think again. 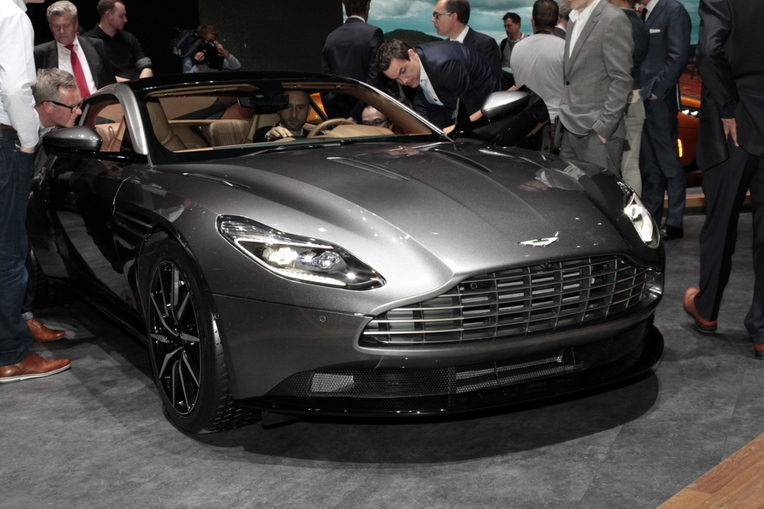 The company finally lifted the lid on the all-new DB11 at the Geneva Motor Show. The car showcases a fresh, distinctive design, which is still unmistakably Aston Martin. Built upon a new lighter, stronger, and more space efficient bonded aluminium structure, the DB11 is the most powerful DB in the history of the marque. Perhaps even more significant, is that it is the first wholly new model since the introduction of the DB9 in 2003. Like every Aston Martin, the heart of the DB11 is found beneath the bonnet. Unlike any Aston Martin before it, the DB11’s powerplant is a 5.2-litre twin-turbocharged V12. This new engine, which was designed in-house, develops 600BHP and 700Nm of torque. Top speed is an exact 200mph, with a 0-62mph coming up in just 3.9sec. Aston Martin are keen to stress the depth of technology in the car and used to develop and design the car. Perhaps this is only natural, considering the criticism leveled at the company for continually flogging its previous aging platforms to death. In particular, Aston Martin point to the innovative aerodynamics utilised in the DB11. The first key feature is the gill-like “Curlicue” which releases high-pressure air from inside the wheel arch via a concealed vent within the side-strakes. Meanwhile, rear-end lift is reduced by the Aston Martin “AeroBlade” – a virtual spoiler fed by discreet air intakes located at the base of each C-pillar. Air is ducted through the bodywork, before venting as a jet of air from an aperture in the rear decklid. The DB11’s chassis, suspension, steering and electronics have been designed to work in harmony through three driver-selectable dynamic modes – GT, Sport and Sport Plus. These modes progressively intensify the response of the engine, 8-speed automatic ZF transmission and the new electric power steering, whilst increasing the firmness of the adaptive damping. Dr Andy Palmer CEO of Aston Martin said: “This is not only the most important car that Aston Martin has launched in recent history, but also in its 103-year existence. The DB11 rightfully places Aston Martin once again as a leading brand in the luxury automotive market”. The DB11 begins at a cool £154,900 and first deliveries of the DB11 are scheduled for the end of 2016.